Ember is a very different dog from Mace, and has required a different approach to training. Ember is very soft, and easily discouraged. She learns by watching and then practicing on her own. It's hard to encourage her when she's doing right, because she will stop and come to you for praise. So, Ember has learned mostly by watching what I am doing, or watching Mace work, then joining in. She also 'practiced' on our horses from the time she was six or seven months old - much to my chagrin. I don't generally like the dogs messing with the horses, but for Ember, it has worked well. She has learned how to make those big animals move, and how to put them where she wants them (at their hay feeder in the winter!). As a young pup, she was in the barn with us and our free-ranging chicks. As we worked, I noticed that she was nonchalantly searching around the barn. She was very quiet, and didn't seem to be focused on anything in particular. Except for the fact that all the chicks ended up back at their night-time pen, you wouldn't think she was paying any attention to them. Hmmm. She has a sense of order, and knows how to take responsibility. When she was about seven months old, we needed to move cows and calves into an adjacent grain stubble field. I took Mace and Ember with me. 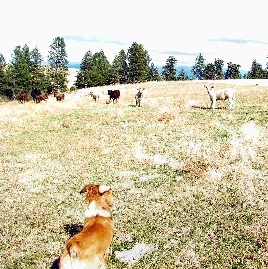 Mace knew what to do, but this was Ember's first exposure to cattle. I had her on a long line, more to keep her safe than to control her. 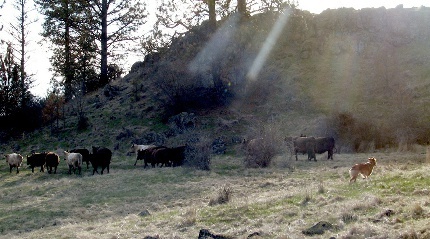 The cows and calves were in the brush along the creek. We had to weave through the brush to make sure we had all the cows and calves. I made sure that Ember went out and around the cattle, pushing them up the hill. When calves would stop to look at her, we would pause and go slowly to make sure the calves would turn and follow their mothers. You don't want calves separated from their mothers - everyone gets confused, and confused calves are almost impossible to move in the direction you want them to go! Ember has not been to any training clinics, and I'm not sure that I will ever take her to one. She seems to learn better with on-the-job training. Here, Ember and I have stopped to let these calves decide to turn and follow their mothers. Ember learned to be patient and take it slow with calves. Here, Ember has started the cows back toward their feeding area. Mace and I are following along, but she is moving the cows by herself. She's circled out to the right to push the stragglers up with the rest of the bunch. All of them were soon out of sight in the trees to the left. When she was about a year old, our cattle escaped their feeding area and left for their summer pasture. It was early in the year, and the grass needed to grow more before being grazed. I took the dogs with me to put the herd back where it belonged. Mace hadn't been working stock lately, so I put a long line on him to control his exuberance. Ember was loose. As we got to the cattle herd, Ember barked and bounced at them and they started moving. Oops. Not quite the right direction, so I called her to come with me around to the correct side. She came around, then moved them up to their trail. She flanked out around them, tucking the stragglers in and moving them back toward their feeding area. They were soon out of sight, but Mace and I followed along through the trees. We came out into a grassy opening, and Ember was still with them. They weren't moving down the hill through the rocks very fast. Mace and I helped her get them all moved down to the creek. Once they crossed the creek at the bottom, Ember moved them up the trail and back through "the gate" while I trudged slowly up the hill. She did most of the job by herself. Ember obviously learned quickly from these first two exposures to cattle work. Here she is a month later, helping Mace put the cows through the same gate when they had escaped again. Working together like this has helped both dogs work better. Mace's experience and power build Ember's confidence. Ember's quiet, calm work helps Mace stay calm too. 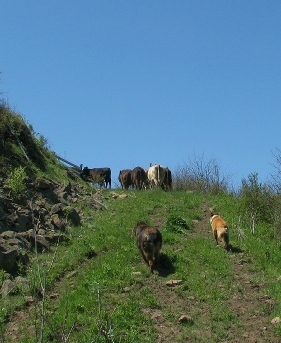 I like having the dogs helping me - I don't have to climb up that rocky hill on the left to make sure the cows don't cut back that way instead of going through the gate.